I was recommending Boom Town to customers for about two months before it actually came out. It is so good that I become incoherent trying to explain why. Imagine the platonic ideal of the Great American Novel, but nonfiction. 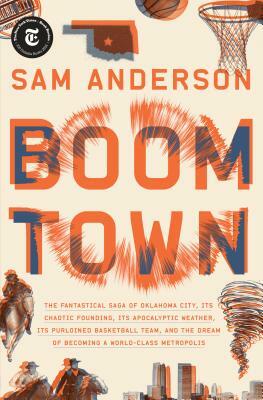 A sprawling civic history of Oklahoma City told through the rise and fall of its basketball team, Boom Town has basically everything--the death of the man who killed the man who killed Jesse James (please keep up), a criminally overlooked civil rights leader, an aging indie rock star, a nefarious city planner, tornadoes. Most importantly it's funny--sad too, but still funny. Such a relief in a sea of Trump books! I am not from Oklahoma and I know very little about basketball, but this book is a banger. “If you could snap your fingers and instantly invent a city from scratch, you’d be hard-pressed to conjure a weirder one than Oklahoma City… This, and so much more, is the subject of Sam Anderson’s fantastic new book, Boom Town, an enthralling, hilarious, and unexpectedly moving biography of Oklahoma City that already feels like a classic of its kind. Think City of Quartz if Mike Davis was a basketball junkie (City of Courts?) or if Jane Jacobs had co-written Blazing Saddles... [Anderson] will have you opening your preferred travel app, idly pricing tickets to the Sooner State." "[Boom Town is] one of my favorite things I've read in the past year. I think it will go down in history as one of the great pieces of narrative nonfiction." “It’s hard to believe that any biography of any American city could be more consistently interesting, entertaining and informative than this one." —VULTURE, "8 New Books You Should Read This August"
"A wild ride of a book that goes from fascinating to hilarious to hair-raising to powerfully moving, sometimes in the space of just a few pages. With clear-eyed affection and consummate skill, Anderson shows us an amazing American place wherein we recognize ourselves." "No one—no one—writes like Sam Anderson: so vividly, so stylishly, so smartly, so weirdly, so funnily. By the time I’d finished this doozy of a book, he had me asking: Oklahoma City, where have you been all my life?"